When One-of-a-Kind is laughed at by Purple for being weird and Green playfully calls One a klutz after tripping on the stairs, is the Tease Monster to blame? With words of wisdom from Mom about the Tease Monster, One discovers that teasing is part of life. And not all teasing is the same. One learns that laughing at someone (mean teasing)has a hurtful bite, but laughing with someone is alright when it’s not done out of spite. One of a Kind is learning to tell the difference between nice teasing from a friend, mean teasing from a bully, and the inevitable teasing that exists with the family unit. Teasing is a normal social exchange that can be used to create closer relationship and connection. However, teasing can also cross the line from playful to hurtful when people use it to gain social status do harm. 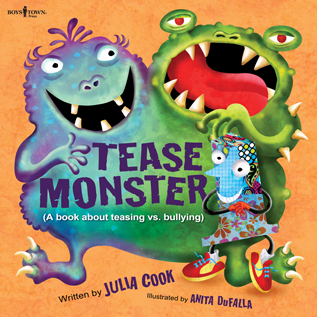 This book contains helpful, real-world advice for dealing with teasing, as well as identifying when teasing has crossed the line into bullying. It also includes advice on what to do in situations where bullying takes place. This book is part of the Building Relationships series from Boys Town Press.